Thailand Deputy Prime Minister and Education Minister, H E Mr Phongthep Thepkanjana, declared open the 35th SEAMEO High Officials Meeting on 28 November 2012 at the Grand Millennium Hotel, Bangkok, Thailand which brought together education deputy ministers, permanent secretaries, directors general and other high-level education officials of the SEAMEO Member Countries for its annual assembly to discuss important issues on education in the Southeast Asia region. In his opening speech, Thailand Education Minister underscored the importance of achieving the Millennium Development Goals and the Education For All goals, particularly in SEAMEO Member Countries. He emphasized the need to define post-2015 education and development agenda globally and in SEAMEO, and called for greater collaboration in providing the educational needs of disadvantaged population groups in the region. The Thailand Education Minister applauded SEAMEO for its significant contributions in enhancing the quality of education in various fields and responding to concerns many SEAMEO Member Countries share about the high rate of secondary drop out and poor performance in key subject areas. “Investing in our teachers is the key to reversing this trend” he said and went on to commend the SEAMEO Centres for the many professional development initiatives for teachers to help address the issue of student learning and school performance. He also stressed the need for SEAMEO be a strategic partner of ASEAN in building the human capital needed to drive economies and ensure sustainable growth under the ASEAN Community. This year’s meeting of the SEAMEO High Officials responded accordingly to the message of the Thailand Education Minister and discussed various education issues such as Education For All, disaster risk reduction in education, hygiene and water in schools, database on education, and increasing the efficiency of education systems. Agreement was also reached to revitalize and strengthen the implementation of the ten multi-country collaborative projects on Reaching the Unreached. The education leaders also reviewed the 2011-2020 SEAMEO Strategic Plan and recommended specific actions to take for its implementation. 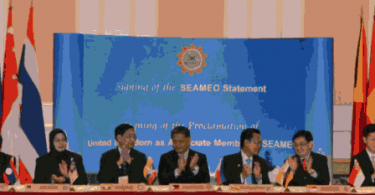 Vietnam was elected Chair of the 35th SEAMEO High Officials Meeting. One highlight of the 35th SEAMEO High Officials Meeting was the awarding of the winners of the SEAMEO-Japan Education for Sustainable Development (ESD) Award which recognized best practices in ESD in schools in Southeast Asia. 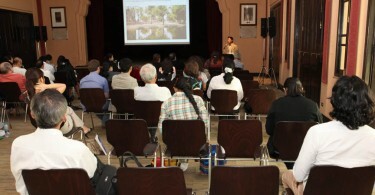 The recognitions were garnered by Myanmar, the Philippines and Indonesia as first, second and third prizes, respectively. Thailand received a special award for best project implemented by a small school with under 150 students. A new award called the SEAMEO-Australia Education Links Award was also launched during the Meeting which seeks to reward innovative projects or proposals that demonstrate effective and inspiring efforts of individuals and organizations to improve education cooperation and linkages across the SEAMEO region and between SEAMEO Member Countries and Australia. One hundred twenty-one participants representing ten out of eleven SEAMEO Member Countries, four Associate and Affiliate Members, and observer delegations from ten other international organizations such as the Ministry of Education, Culture, Sports, Science and Technology (MEXT) Japan, Ministry of Education, Science and Technology (MEST) Republic of Korea, ASEAN Secretariat, ASEAN-China Centre, Asian Development Bank, Organisation for Economic Co-operation and Development, Korean Educational Development Institute, UNESCO Bangkok, UNICEF EAPRO, and United Nations University Institute of Advanced Studies took part in the three-day Meeting that started from 27 to 29 November 2012. Centre Directors and key officials of the SEAMEO Regional Centres and the SEAMEO Secretariat also attended the Meeting. The SEAMEO High Officials Meeting is an annual event of SEAMEO that serves as forum for high-level officials to discuss priority issues of SEAMEO and prepare the agenda for the 47th SEAMEO Council Conference, a summit of the education ministers of the 11 SEAMEO Member Countries which will be hosted by the Government of Vietnam in Hanoi from 19 to 21 March 2013. The SEAMEO Secretariat in cooperation with the Ministry of Education, Thailand organized the 35th SEAMEO High Officials Meeting. The 7th ASEAN Senior Officials Meeting on Education (SOM-ED), and the ASEAN SOM-ED Plus Three were convened immediately after the 35th SEAMEO High Officials Meeting on 29 and 30 November 2012 at the same venue.